The [Lord Mayor2] made his progress with the greatest possible pomp he could devise, always alluding to his line of trade with huge expenditure [...] We watched as a large flotilla, including the big vessels already mentioned, made an appearance accompanied by innumerable small boats of sightseers [...] Accompanied by thundering canon [sic] and fireworks, a very numerous and well-appointed group of musicians sang and played on fifes, drums, and other instruments. They were rowed swiftly upriver with the swelling tide, to the constant peal of firing ordnance. 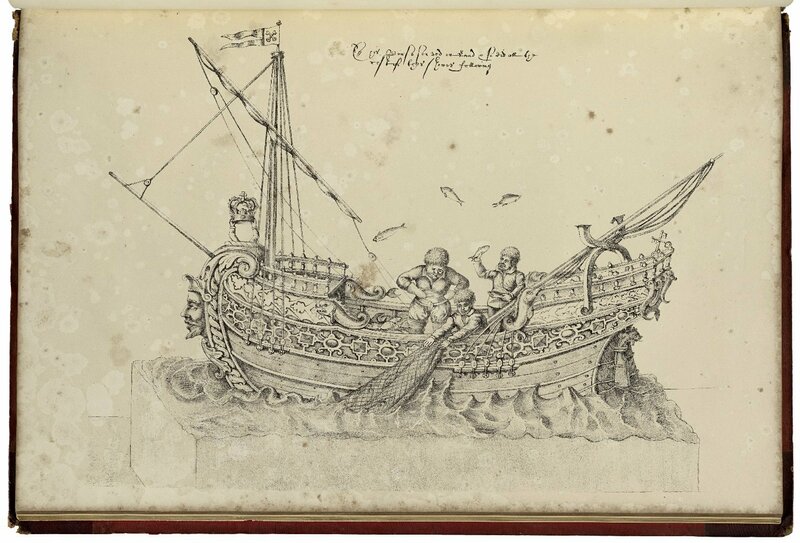 The fishmongers’ pageant, on Lord Mayor’s Day, 1616: Chrysanaleia, the golden fishing. Image courtesy of LUNA at the Folger Shakespeare Library. Busino recounts the sea spectacles on the Thames that preceded the Lord Mayor’s processional along London’s chief thoroughfares, from the river to St. Paul’s Churchyard, eastward along Cheapside, and ultimately to Guildhall, the seat of the City’s government. Coronation entries proceeded in the opposite direction, from the Tower of London, westward along Cheapside to Temple Bar, and on to Westminster. The thundering sounds that Busino describes must have commanded the ears of everyone—from the rulers and aristocrats in the procession, to the guildsmen lining the pageant route, to the masses surrounding them. A great variety of sounds made up the soundscape of early modern pageantry. Busino alludes to the harmonies of well-appointed musicians (described in Music below); their music would have ranged from the melodious voices of child singers to the piercing blare of trumpets. Busino also mentions the constant explosions of fireworks and gunfire, and he goes on to note that the insolence of the crowd is extreme, with its noisy, chaotic mixture of people (Busino 1266). Amidst all of this tumult, he scarcely alludes to the refined verse and elaborate speeches that the leading poets of the day fashioned for outdoor pageants, to be spoken aloud. These diverse sounds did not always work to a unified purpose: some sounds blasted out a declaration of royal authority, while others asserted the power of livery companies, allowed poets to articulate didactic agendas, or arose from the revelry of bustling crowds—sometimes all at once. Pageant poets addressed this problem by educating their audiences in the symbolic meaning of the spectacles. Continuing the long tradition of festival books that illustrated courtly ceremonies and events, poets composed printed pamphlets that commemorated pageants and outlined their allegorical programs. 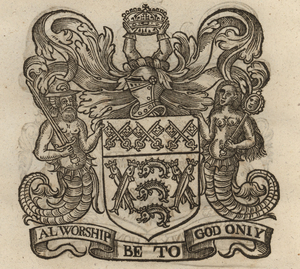 It is standard for these printed records to claim to represent all components of a spectacle completely and veraciously, as in the title page of John Taylor’s 1634 Lord Mayor’s Show The Triumphs of Fame and Honour, which promises that The particularities of every Invention in all the Pageants, Shewes and Triumphs both by Water and Land, are here following fully set downe (Taylor sig. A2r). All that is literally set downe, however, is Taylor’s own writing: his idealized, linguistic version of a much larger, incomplete, or more unwieldy event. Other pageant books acknowledge that some of their contents were never performed: Anthony Munday notes that Leofstane’s description of a mining allegory in Chrusothriambos (1611) went unspoken so as to avoid an offenſiue, and troubleſom delay, but the speech is nevertheless printed so that readers might peruse it with much better leyſure (Munday sig. C1v). With notable exceptions including the pageants of Thomas Dekker (as we shall see), pageant books often downplay the performative experience of pageantry. Instead of emphasizing the sonic, visual, and haptic impression on the audience, printed records tend to give the impression that pageants are objects of silent contemplation. Thomas Middleton’s 1616 pageant Civitatis Amor, which celebrated the investiture of Prince Charles as Prince of Wales, provides an example of the silencing that pageant records made possible. Middleton’s account begins by alluding to the sea spectacles that preceded the royal party’s arrival at Chelsea, complete with barges richly decked with banners, steamers, and ensigns, and sundry sorts of loud-sounding instruments aptly placed among them (Middleton 35-37). As was often the case in sea spectacles of the period, these instruments included trumpets wielded by Tritons, mythological messengers accompanying the sea god, Neptune. The first lines of verse in the pageant, spoken by a personage figuring London, endeavor to subdue the trumpets and the other sounds that filled the air, asking Neptune, To make our loves the better understood, / Silence thy watery subjects, this small flood (Middleton 54-55). That may this lady’s voice confound. Be silent till we wave our silver mace. Beguile you of the sweetness of your joys. A greater joy and a more silent one. Middleton does not disguise the commanding power of the over-greedy noise that threatens to disrupt the communicability of his verses and the symbolic content of the spectacle. Yet he frames his description in such a way as to clear out a space for audition, revealing how a preponderance of noise might give way to a greater, more silent experience. It is no coincidence that Middleton’s muted ideal is possible not during the event itself, with its overwhelming commotion, but in a printed pamphlet that allows a poet to decide what is, and is not, recorded. Or else our spell is marred. Prospero is an expert at using art and performance as tools for power; these are the chief means by which he crafts his dominion over others. His acknowledgement that his spells can be marred by unwanted sounds reveals his awareness of the importance of silence to his symbolic and political ends. Fittingly, Prospero’s demands for silent attention are followed in short order by the strange, hollow, and confused noise that interrupts the spectacle, a noise associated with the play’s subaltern rebellion (Shakespeare 4.1.138 s.d.). Like the poets and impresarios of the pageant tradition, Prospero is all too aware of the power, and fragility, of silence. Shakespeare is uncommon among his fellow poets and dramatists in that (as far as we know) he was not directly involved in producing any pageants. Many of the period’s most prominent poets, including Middleton, Thomas Dekker, Thomas Heywood, George Gascoigne, Philip Sidney, and Ben Jonson3 wrote the text for one or more outdoor pageants. Printed descriptions of their contributions, full of sophisticated allusions to antiquity and eloquent lines of verse, helped poets demonstrate their literary artistry even as a variety of sounds threatened to distract from what they wrote. It is Middleton’s ability to give the historical subject matter of the pageant Forme or aesthetic shape that (according to this title page) enables him to redeem the past. The printed pamphlet advertises him as more refined and capable than history’s Common Writer, a term that appears to refer not to a specific person but to a base, mundane style of recording history. To tell olde Britaines new borne happy day. Speaking in the rime royal verse form associated with Chaucer, Brute suggests that poetry both revives English history and provides a means of celebrating the present. Discription of a maske, presented before the Kinges Majestie at White-Hall, 1607. 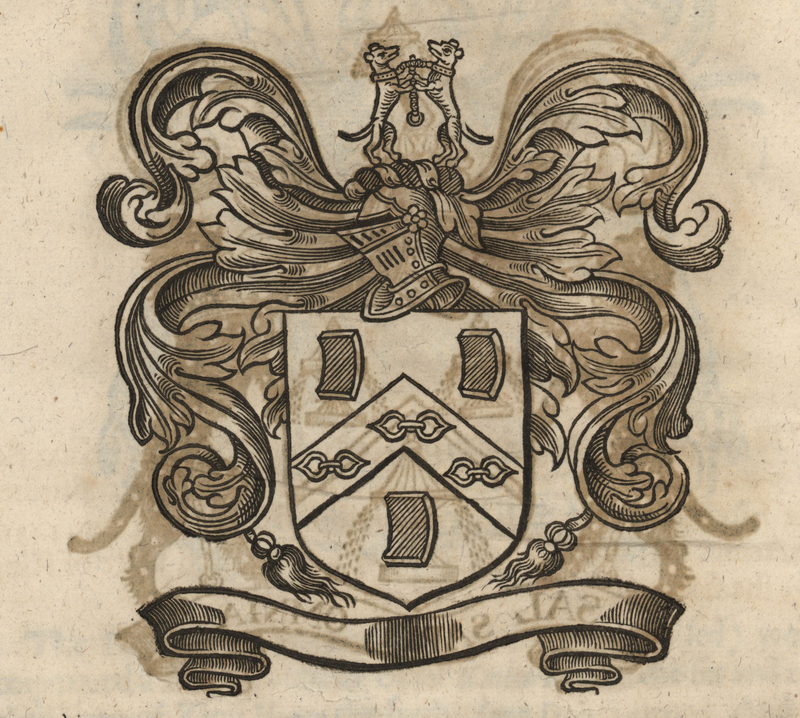 Image courtesy of LUNA at the Folger Shakespeare Library. The irony that underlies Munday’s confidence in the power of poetry here—and the printed pamphlet that records it—is that the performance of The Triumphs of Reunited Brittania was abruptly cancelled after its floats were destroyed in a storm. The title page of Munday’s printed record claims that the Lord Mayor was inaugurated on Tuesday the 29. of October. 1605, as planned, but guild records from that year indicate a different story: by reason of the greate rayne and fowle weather hapnyng [...] the greate coste the Company bestowed upon their Pageant and other shewes were in mann[er] cast away and defaced (qtd. in Sayle 83). The Merchant-Taylor’s livery company produced another version of the Lord Mayor’s ceremony soon afterward, but at a fraction of the cost of the elaborate performance that Munday describes.4 The artful poetry that is recorded in Munday’s printed pamphlet thus departs remarkably from what was spoken and performed—which helps to explain why printed pamphlets were so important for poets in clarifying and preserving their agendas. Neither was it becoming, or could it stand with the dignity of these shows, after the most miserable and desperate shift of the puppets, to require a truchman [interpreter] or (with the ignorant painter) one to write, ‘This is a dog’ or ‘This is a hare’, but so to be presented as upon the view they might without cloud or obscurity declare themselves to the sharp and learned. And for the multitude, no doubt but their grounded judgements gazed, said it was fine and were satisfied. Why should a poet bother to explain his verses to the multitude if they are incapable of understanding his verse? For Jonson, poetry provides the meaningful essence of the pageant, and the printed record of this poetry provides a means for the sharp and learned to remember and appreciate the significance of the event. Audiences and passersby are at best window dressing and, at worst, nuisances. Being heated, melts into an Orphean choir. In some ways this passage is just as pedantic as Jonson’s: Dekker’s allusion to Delphic fire implies that his own Apollonian pen has the power to heat and fuse the diverse voices that contribute to the pageant into a unified choir. Yet Dekker differs from Jonson by emphasizing that the voices of the multitude are part of his poetry and central to the symbolic meaning of the pageant. Every tongue speaks music because every audience member contributes to the legitimacy of the celebration, honoring the king through their collective will. Dekker’s poetry is not directed simply toward a pageant book, to be contemplated by a select and private readership. For him, pageant verse is the provenance of the entire City, to be heard, understood and created in performance. In the passage above, music is partly a metaphor for written poetry; tongues speak music and are associated with the ink of pen[s]. Yet, according to Dekker’s metaphor, what makes a poet’s writing sweet are the fiery voices of the choir of Orpheus, the paragon of mythological singers. Pageant poets participate in a performative process that includes not just written records but a range of musical instruments and voices. As Dekker is well aware, a poet’s pen is accompanied by the rhythms and tones of shawms, trumpets, fifes, flutes, tabors, and drums, along with the singing of choruses and soloists. 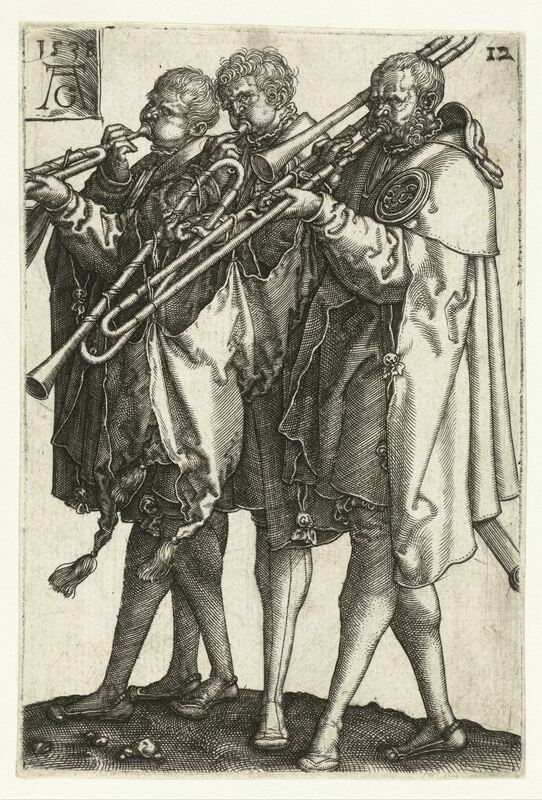 Drie muzikanten, Heinrich Aldegrever, 1538. Image courtesy of the Rijks Studio, Rijksmuseum. Among the most conspicuous sounds that resonated through the streets of London on pageant days were the heralds and flourishes of trumpets and cornets. Lord mayor’s shows typically included two to three dozen trumpeters, supplied with banners and sometimes horses.6 Royal entries were even more extravagant, with mythological personages trumpeting out salutes at every turn. Drums also resounded through the streets of London on pageant days to salute dignitaries and command the attention of the crowd, from the staccato beats of tabors to the resonant booms of kettle drums. Since the loud, august sounds of drums and trumpets were also associated with early modern warfare, they supplied a sense of patriotic zeal to the occasion. Music extended well beyond these blaring soundmarks, a term for sounds that are distinctive or specially regarded in a given social setting (Schafer 10). Sprinkled regularly through royal entries and Lord Mayor’s Shows are songs for boy vocalists that would have been accompanied by viols and other instruments. Royal entries were associated especially with consorts of lute, bandora, base viol, cittern, treble viol, and flute, now known as mixed or English consorts. These very well funded monarchal spectacles seem to have involved a wide variety of instrumental and vocal music. In the 1604 Magnificent Entertainment, for example, Dekker’s device at the Little Conduit in Cheapside included a music room with a variety of tunes that danced round about it; for in one place were heard a noise of cornets, in a second a consort; the third (which sat in sight) a set of viols, to which the Muses sang (1728-31). The core of the musicians involved in London’s pageants were the city waits, an official group originally derived from the guards stationed on town walls. These versatile performers alternated between raising the town from sleep in the morning, playing popular jigs by ear, and performing a courtly repertoire for dignified audiences. The diverse instruments owned by the city waits gives some indication of the range of their performance capabilities. During the early seventeenth century they played shawms, sackbuts, viols, recorders (or flutes), cornets, curtals, violins and lutes (Marsh 121-122). Nearly all towns employed several waits, and London’s crew was the best paid and most sophisticated in the country. 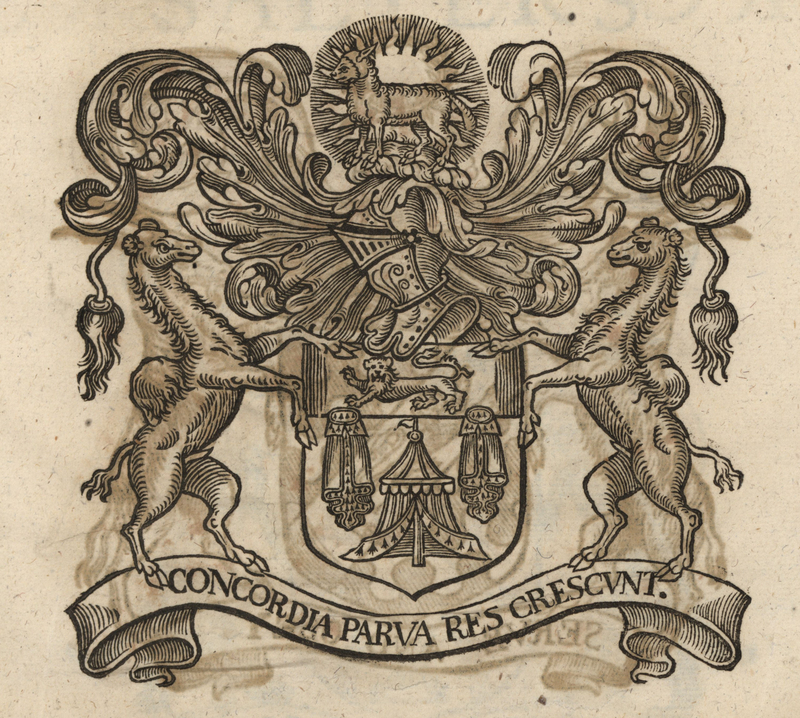 Thomas Morley composed his influential First Booke of Consort Leſſons (1599) with London’s waits in mind, praising them as excellent and expert Muſitians in his dedicatory epistle (Morley sig. A2r). Despite the prominence of music in pageant performances, it is very rare for pageant books to include musical notation. 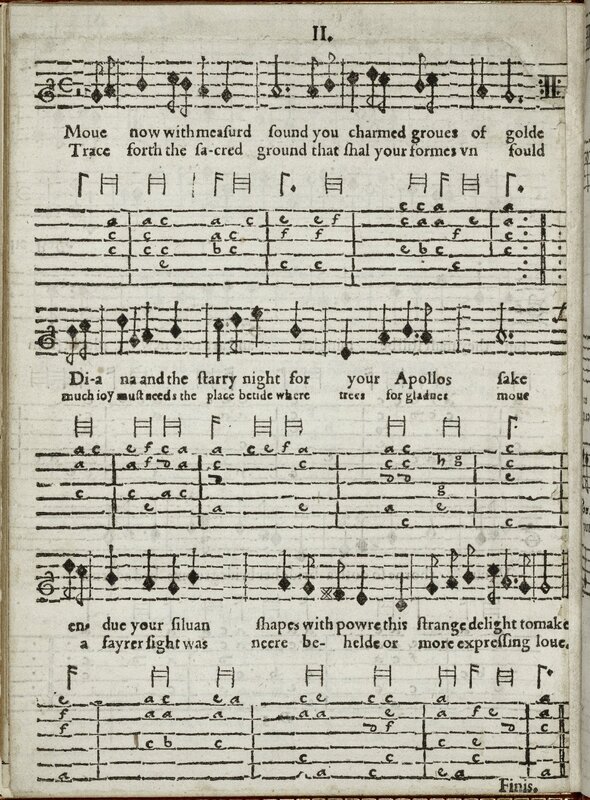 Although there was increasing demand for musical notation beginning in the early seventeenth century, the trade in printed music remained a relatively specialized venture, and pageant records (like printed drama) generally do not expend the additional effort and cost necessary to provide specific tunes.7 Of all of the Lord Mayor’s Shows for which printed pamphlets survive, only two include musical notation: Middleton’s The Triumphs of Truth and Squire’s Tes Irenes Trophæa (see above). In both of these examples, the music consists of two straightforward melodic lines: one for the primary melody, with the words laid below the corresponding notes, and the other for the bassus or viol accompaniment. Both are relatively simple tunes that would enable amateurs to reproduce pageant music in household contexts: the aim is not to cater to refined musicians but to provide a rough semblance of the melody. Concentum inter se, et discrimina grata sonorum aure erudita deprehendit musica, . 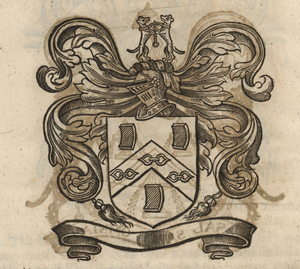 Image courtesy of LUNA at the Folger Shakespeare Library. A fire is ſeene in the Forge, Bellowes blowing, ſome filing, ſome at other workes; Thunder and Lightning on occaſion. As the Smiths are at worke, they ſing in praiſe of Iron, the Anuile and Hammer: by the concor- dant ſtrokes and ſoundes of which, Tuballecayne be- came the firſt inuentor of Muſicke. Alluding to the Book of Genesis, where Tubal-cain is an instructor of every artificer in brass and iron (Gen. 4:22), Dekker invites his audience to hear music in the stroakes and soundes of urban manufacturing. Till thickest barres be beaten flat. Listen to the Smiths’ Song, read by Stanley Plumly, poet laureate of the state of Maryland. The four-stress couplets and the onomatopoetic refrain of the song prompt an audience to sing, stamp, or shout along. Indeed, the onomatopoeia is so thick that we cannot help but privilege the immediate, sensory environs of its utterance. The Thwick a-Thwack s and knick-a-knock s are indexical signifiers: they draw our attention to what the smiths call the Ground ( The Art of Musicke has her Ground ). In the early modern period, ground denotes a recurring melodic line, usually in the bass, that underlies variation in upper parts. In the smiths’ song, our attention is directed to this background: the song’s acoustic surroundings come to be at the center of its musical meaning and experience. Thus, even though the notation for this song is not extant, we can gather a visceral sense of its music. Looking below us onto the street we saw a huge mass of people, surging like the sea, moving here and there in search of places to watch or rest—which proved impossible because of the constant press of newcomers. It was a chaotic mixture. The insolence of the crowd is extreme. They swing up onto the back of carriages, and if one of the drivers turns on them with his whip, they jump to the ground and hurl stinking mud at him [...] everything resolves itself with kicks and punches and muddy faces. A perpetual shower of firecrackers rained from the windows onto the seething crowd, popping mischievously under everyone’s clothes and faces and between their legs. Some men masked as wild giants strode through the crowd with wheels and fireballs, hurling sparks here and there at the bodies and faces of the multitude, but to no avail at making a wide and clear route for the procession. The Pomeranian traveler Lupold von Wedel confirms that policing London’s crowds had long been a problem, noting in his diary that the 1584 Lord Mayor’s Show was preceded by fire-engines ornamented with garlands, out of which they throw water on the crowd, forcing it to give way, for the streets are quite filled with people (von Wedel 225). Busino and von Wedel share a wry and even playful tone, but what they are describing is organized violence.9 London’s governing authorities were willing to turn firecrackers and even early modern water cannons on the crowds—the same crowds that they had spent vast amounts of money to attract. Firecrackers and green men became an expected part of the spectacle, an institutionalized form of crowd control built into the genre itself. Crowds may have been instrumental to the pomp and legitimacy of the dignitaries honored in an outdoor pageant, but they were also threatening and unpredictable. Due in significant part to their distaste for public crowds, Stuart monarchs came to withdraw support for outdoor pageantry.10 James I gained a reputation for scorning the masses and removing himself from their sight; as early as his coronation pageant in 1604, the king was understood to be no champion of what Gilbert Dugdale calls the wylie Multitude (Dugdale sig. B1v). 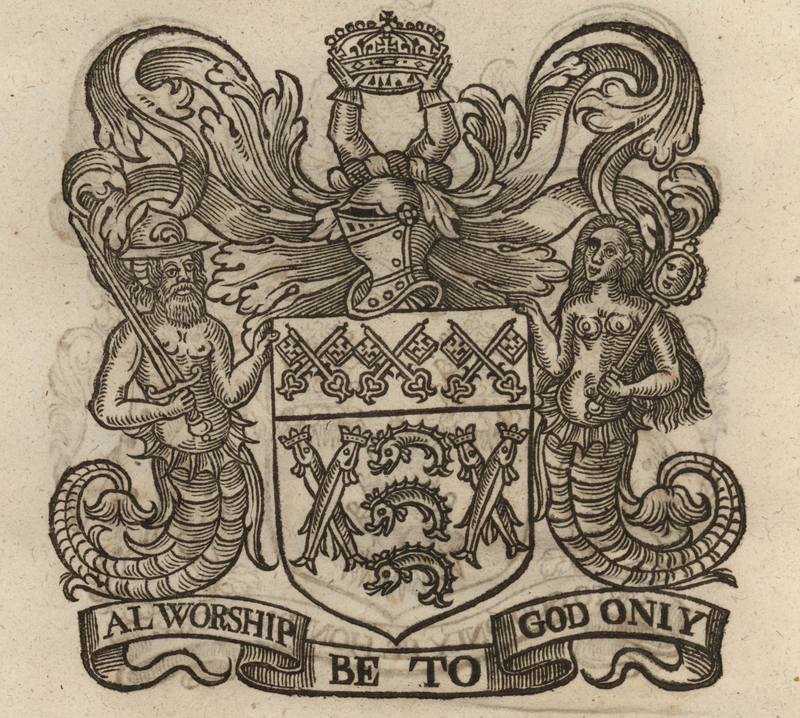 In his account of the The Whole Royal and Magnificent Entertainment of King James, Dugdale acts as something of an apologist for the king, repeatedly emphasizing the rudenes of the Multitude, who regardles of time [place or] perſon will be ſo troubleſome (Dugdale sig. B2r). Justifying James’s avoidance of the crowds on the basis of their dangerous pre[ss]ing, Dugdale characterizes them as a ſtro[n]g ſtream of people violently run[n]ing in the midſt [of the guildmen lining the streets], inclined with ſuch hurly burly, to run vp and downe with ſuch vnreuerent raſhnes (Dugdale sig. B3v, B1v). Over the course of the early seventeenth century, monarchal spectacles became increasingly insular, focusing less on outdoor pageantry and more on the indoor masque. The masque, pioneered by Ben Jonson and Inigo Jones, was a carefully controlled theatrical experience involving the participation of a learned, courtly audience. Like outdoor pageants, masques were commemorated in printed records that allowed their symbolic agendas to be dispersed and elucidated far beyond the performance itself. Yet masques were removed from unstable crowds, performed at the Palace of Whitehall, the Inns of Court, and other spaces of privilege. Pageantry, on the contrary, continued to be defined by the crowds that streamed into the streets, not simply to honor the dignitaries of the moment but to enjoy a holiday from work and celebrate with other loud and raucous Londoners. As we have seen, pageants were extraordinarily noisy enterprises. The flowery verses of allegorical personages, the sweet music of instruments and voices, and the yells and cheers of boisterous crowds competed not only with each other but with London’s everyday sounds, from the cries of street vendors selling their wares to the creaking of wagon wheels and the neighing of horses. On top of all of this, and epitomizing the experience of pageantry for many onlookers, were the fireworks and gunfire that boomed above the Thames and sparkled in the faces of the crowds. A treatise of artificial fire-vvorks both for vvarres and recreation, 1629. Image courtesy of LUNA at the Folger Shakespeare Library. And the King’s trumpeters trumpeted, and they beat the drums and they played on litavra [kettle drums] and there were all sorts of various instruments. And they fired a great salute from the ship in which the Lord Mayor sailed and from other ships which were there and from big boats and from the City wall. And from all the small boats there was a great shooting of muskets. Thruſting ſo hard, that many haue miſcarried. How mighty and tumultuous is that preſſe. In both of these examples, fireworks do not stand alone as acoustic events; instead, they mark a noisy climax in the broader experience of pageantry. And put freſh bloud in Enuies cheekes. The scene is all the more suggestive because it is impossible to distinguish the sounds of misrule and disruption from those of celebration. Envy and her Fort of Furies continue to parley with Virtue throughout the pageant, until, finally, thoſe twelue that ride armed diſcharge their Piſtols, at which Enuy, and the reſt, vaniſh, and are ſeene no more (Dekker sig. C4r)—vanquished by the same disorderly tools with which they are associated. 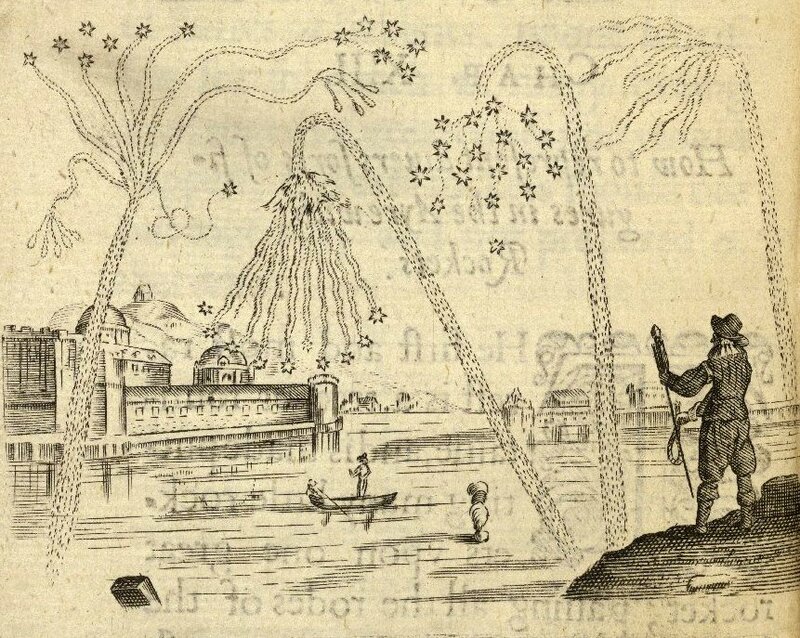 One implication of Dekker’s emphasis on fireworks in Troia-Nova Triumphans is that his printed record becomes open to its environment, providing a sounding board for the sensory environs of the pageant day. Something similar happens in the printed pamphlet for Dekker’s London’s Tempe, where the concordant stroakes of the smiths’ banging melds with the drumming in and around the pageant floats, and the Thunder and Lightning depicted in the fictional Lemnian Forge cannot be distinguished from the fireworks and gunfire set off throughout the Lord Mayor’s Day. By emphasizing the explosive force of rockets, pistols, shrieks, and thunderous banging, Dekker’s pageants draw ambient noise into the core of their symbolic design, incorporating the atmosphere surrounding the text into its allegorical program. If silence is a process of filtering out what we do not wish not to hear, noise is what enters our ears nevertheless, unwelcome and uninvited. Theorists including R. Murray Schafer and Jacques Attali define noise as unwanted sound, and the term was sometimes used in this way during the early modern period as well, as in the strange, hollow, and confused noise that disrupts Prospero’s nuptial entertainment in The Tempest (Shakespeare 4.1.138).11 When noise is conceived in this way, the question becomes who wants a particular sound and who does not—Caliban, Trinculo, and Stephano hope to turn noises, / Sounds and sweet airs to the advantage of their rebellion (Shakespeare 3.2.135-36), and Prospero capitalizes on the noisy confusion of the storm at the outset of the play. What is noise to one character is music to another. Whether sound is wanted is a matter of perspective, that is, and defining what counts as noise could be a powerful act in itself. Poets would be wary of sounds that did not line up with their symbolic goals or that distracted from the exaltation of their patrons. In Dekker’s London’s Tempe, the stroakes and soundes of the smiths in are portrayed as concordant, beautiful music, while in Middleton’s Civitatis Amor, the over-greedy noise of the rambunctious crowd is portrayed as an obstacle to the majesty of Prince Charles. Sound could be a tool to bring out the glory of the dignitary being honored, or it could challenge the very subject of a pageant, undermining the propaganda it wished to convey. Given the pressures involved in describing and defining varying types of noise, many of the sounds of pageantry would not have been recorded at all. Sounds thought by the pageant poet to be irrelevant or extraneous, such as the jingling of morris dancers’ bells or the hawking of balladmongers, might not be considered worthy of record. Embarrassing sounds—the giggling of impertinent onlookers, perhaps—might have been excised from written records or never have made it to the page in the first place. Quieter sounds such as the strumming of lutes or the whispering of courtiers might have been heard by too few people to be likely to survive. Conjuring up the soundscape on pageant day requires extrapolating from the hints that survive: since we know from livery company account books that sweetmeats were frequently purchased in advance of pageants, for example, we can assume that, underneath so many louder noises, they made a crunching sound in the mouths of spectators. Since we can never know exactly what goes unacknowledged in surviving descriptions and records, hearing the sounds of pageantry requires imagination. The same could be said of other historical phenomena; manuscripts, printed books, and other materials from the past are constantly subject to destruction, forgetfulness, and misunderstanding. Before the advent of audio recording technologies, however, sound was especially vulnerable to ephemerality and loss. This makes listening to historical soundscapes a creative act: grounded in detail and attentive to context, but always dependent upon an open mind and an open ear. Attali, Jacques. Noise: The Political Economy of Music. Translated. Brian Massumi. Manchester: Manchester UP, 1985. Bergeron, David M. English Civic Pageantry 1558–1642. London: Edward Arnold, 1971. Busino, Orazio. Orazio Busino’s Eyewitness Account of The Triumphs of Honour and Industry. Translated. Kate D. Levin. Thomas Middleton: The Collected Works. Ed. Gary Taylor and John Lavagnino. Oxford: Oxford UP, 2007. 1264-70. Dekker, Thomas. The magnificent entertainment giuen to King James, Queene Anne his wife, and Henry Frederick the Prince, upon the day of his Majesties triumphant passage (from the Tower) through his honourable citie (and chamber) of London, being the 15. of March. 1603. As well by the English as by the strangers: with the speeches and songes, deliuered in the severall pageants. London: Printed by Thomas Creede for Thomas Man the younger, 1604. EEBO. Reprint. Subscription. Dekker, Thomas, Stephen Harrison, Ben Jonson, and Thomas Middleton. The Whole Royal and Magnificent Entertainment of King James through the City of London, 15 March 1604, with the Arches of Triumph. Ed. R. Malcolm Smuts. Thomas Middleton: The Collected Works. Gen. ed. Gary Taylor and John Lavagnino. Oxford: Oxford UP, 2007. 219-79. Dugdale, Gilbert. 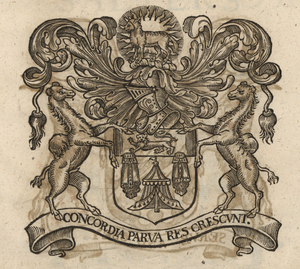 The time triumphant declaring in briefe, the arival of our soveraigne liedge Lord, King James into England, his coronation at Westminster: together with his late royal progresse, from the Towre of London throúgh the Cittie, to his Highnes manor of White Hall. Shewing also, the varieties & rarieties of al the sundry trophies or pageants, erected... With a rehearsall of the King and Queenes late comming to the Exchaunge in London. London, 1604. EEBO. Reprint. Subscription. Fennor, William. Cornu-copiae, Pasquils night-cap. London, 1612. STC 10782.5. EEBO. Leahy, William. Elizabethan Triumphal Processions. Aldershot, U.K.: Ashgate, 2005. Manley, Lawrence. Literature and Culture in Early Modern London. Cambridge: Cambridge, UP, 1997. Marsh, Christopher. 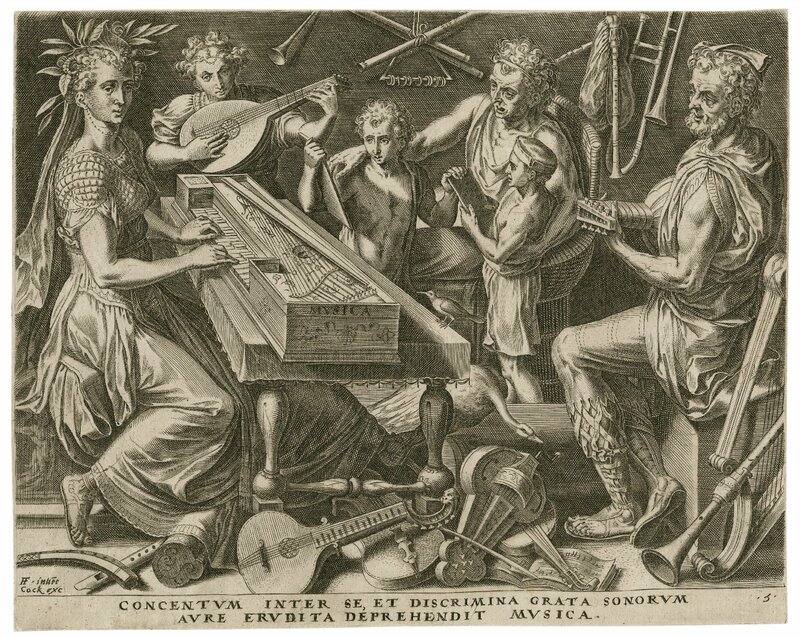 Music and Society in Early Modern England. Cambridge: Cambridge UP, 2010. Middleton, Thomas. Civitatis Amor. Ed. David Bergeron. Thomas Middleton: The Collected Works. Gen. ed. Gary Taylor and John Lavagnino. Oxford: Oxford UP, 2007. 1202-8. Morley, Thomas. The First Booke of Consort Lessons. London, 1599. STC 18131. EEBO. Munro, Ian. The Figure of the Crowd in Early Modern London: The City and Its Double. New York: Palgrave Macmillan, 2005. Northway, Kara. [H]urt in that service : The Norwich Affray and Early Modern Reactions to Injuries during Dramatic Performances. Shakespeare Bulletin. 26.4 (2008): 25-52. Subscription. doi:10.1353/shb.0.0039. Robertson, Jean, and D. J. Gordon, eds. Collections, Vol. III: A Calendar of Dramatic Records in the Books of the Livery Companies of London, 1485-1640. Oxford: Malone Society, 1954. Sayle, R. T. D., ed. Lord Mayors’ Pageants of the Merchant Taylors’ Company in the 15th, 16th & 17th Centuries. London: The Eastern P, Ltd., 1931. Schafer, R. Murray. The Soundscape: Our Sonic Environment and the Tuning of the World. 2nd ed. Rochester, VT: Destiny Books, 1994. Shakespeare, William. The Tempest. Ed. Brent Whitted and Paul Yachnin. Internet Shakespeare Editions. Open. Smith, Jeremy L. Thomas East and Music Publishing in Renaissance England. Oxford: Oxford UP, 2003. Smuts, R. Malcolm, ed. The Whole Royal and Magnificent Entertainment of King James through the City of London, 15 March 1604, with the Arches of Triumph. 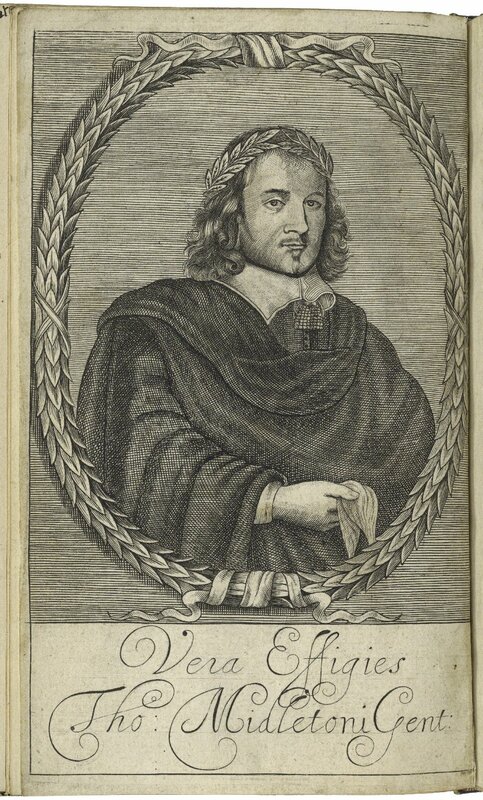 Thomas Middleton: The Collected Works. Gen. ed. Gary Taylor and John Lavagnino. Oxford: Oxford UP, 2007. Spenser, Edmund. The Faerie Queene. Ed. A. C. Hamilton, Hiroshi Yamashita, and Toshiyuki Suzuki. Rev. 2nd ed. Harlow, U.K.: Pearson Longman, 2007. The Bible: Authorized King James Version with Apocrypha. Ed. Robert Carroll and Stephen Prickett. Oxford: Oxford UP, 2008.
von Wedel, Lupold. Journey Through England and Scotland Made by Lupold von Wedel in the Years 1584 and 1585. Translated. Gottfried von Bülow. Transactions of the Royal Historical Society, New Series. 9 (1895): 223-70. Subsc. doi:10.2307/3678110. Ziuzin, Aleksei. An Account by Aleksei Ziuzin. Ed. Maija Jansson and Nikolai Rogozhin. Translated. Paul Bushkovitch. Thomas Middleton: The Collected Works. Gen. ed. Gary Taylor and John Lavagnino. Oxford: Oxford UP, 2007. 977-79. Trudell, Scott. The Sounds of Pageantry. The Map of Early Modern London, edited by Janelle Jenstad, U of Victoria, 20 Jun. 2018, mapoflondon.uvic.ca/SOUN1.htm. Trudell, Scott. The Sounds of Pageantry. The Map of Early Modern London. Ed. Janelle Jenstad. Victoria: University of Victoria. Accessed June 20, 2018. http://mapoflondon.uvic.ca/SOUN1.htm. Trudell, S. 2018. The Sounds of Pageantry. In J. Jenstad (Ed), The Map of Early Modern London. Victoria: University of Victoria. Retrieved from http://mapoflondon.uvic.ca/SOUN1.htm. Personification of virtue. Appears as an allegorical character in mayoral shows. See also Arete. Personification of envy. Appears as an allegorical character in mayoral shows. Allegorical character representing the city of London. See also the allegorical character representing Roman London, Troya-Nova. Composer renowned for his work on the English madrigal. Not to be confused with Thomas Morley, who is buried in Austin Friars, or Thomas Morley, buried in All Hallows Barking. Personification of London’s genius. Appears as an allegorical character in mayoral shows. The Fishmongers’ Company was one of the twelve great companies of London. The Fishmongers were fourth in the order of precedence established in 1515. The Company was originally two companies, the Stock-fishmongers and the Salt-fishmongers (or simply Fishmongers). They were united in 1536 under the designation of The Wardens and Commonalty of the Mystery of Fishmongers of the City of London (Herbert 4) The Worshipful Company of Fishmongers is still active and maintains a website at http://www.fishhall.org.uk/, including a section on their history and heritage. The Merchant Taylors’ Company was one of the twelve great companies of London. Since 1484, the Merchant Taylors and the Skinners have alternated precedence annually; the Merchant Taylors are now sixth in precedence in odd years and seventh in even years, changing precedence at Easter. The Worshipful Company of Merchant Taylors is still active and maintains a website at http://www.merchanttaylors.co.uk/ that includes downloadable information about the origins and historical milestones of the company. The Haberdashers’ Company was one of the twelve great companies of London. The Haberdashers were eighth in the order of precedence established in 1515. 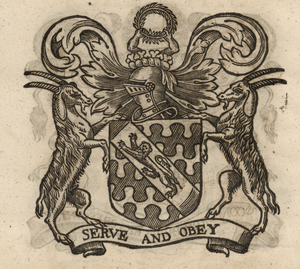 The Worshipful Company of Haberdashers is still active and maintains a website at http://www.haberdashers.co.uk/ that includes a history of the company and of their hall. The Ironmongers’ Company was one of the twelve great companies of London. The Ironmongers were tenth in the order of precedence established in 1515. The Worshipful Company of Ironmongers is still active and maintains a website at http://www.ironmongers.org/ that includes a page on their history.